A deeply peaceful sunny day here in Wirksworth, with only the gentle throb of the class 117 to disturb the day's tranquillity. 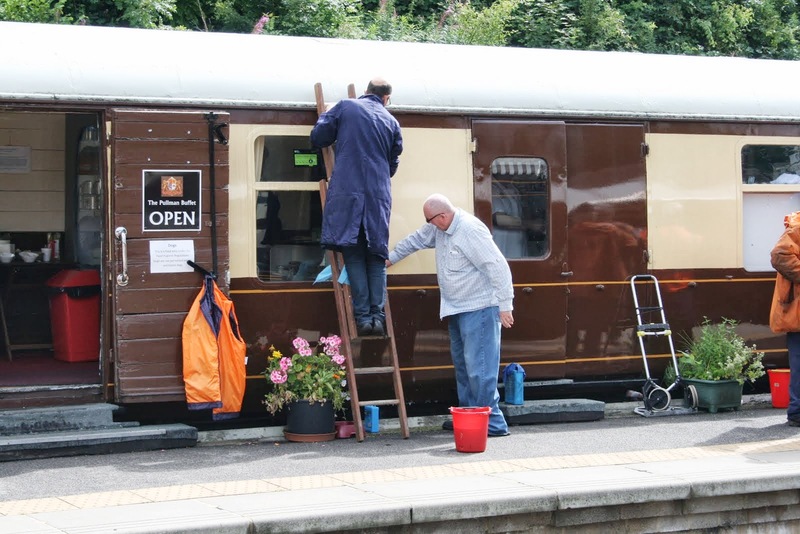 Railcar Enterprises spent the day scrubbing the said vehicle and used up the national supply of Tesco's Wash and Wax. Down the yard, the Third Open was attended to by Smith Enterprises and the LMSCA's close personal friend, and more bits of it re-appear each week. 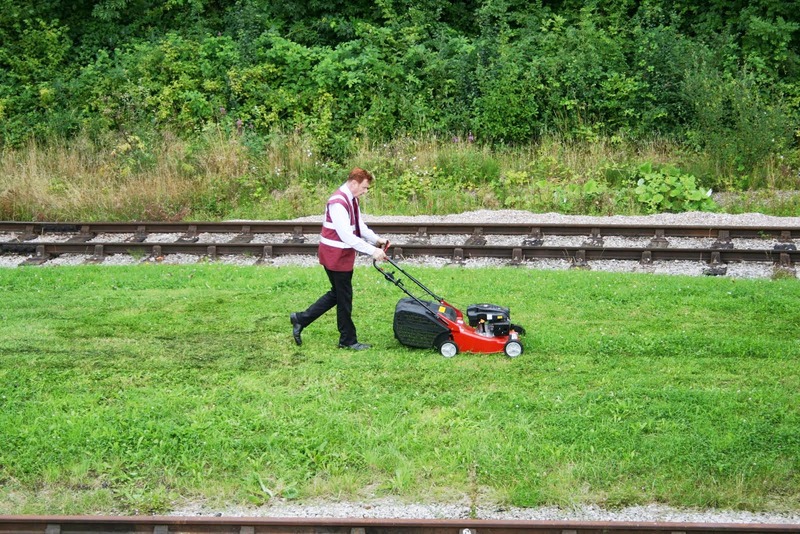 At both ends of the line, the Station Foremen fixed benches, weeded and mowed the grass in the afternoon sunshine. The steam team attended to L&Y 1300 in preparation for its final weekend of passenger services, amidst the gentle tweeting of the Peak District's bird population. Mea culpa! Made a right botch of a tribute to Charles - Charles Underhill was the last Principal of the School of Transport in Derby - I am sure he will forgive me as we had many convivial meetings where the world of rail was put to rights! A most wonderful day rounded off our experimental Thursday operation that broke all financial records and was really enjoyed by a great many visitors. The photo shows the crowds awaiting the 1220 Wirksworth to Duffield. My thanks go to the train crew, Booking Halls at Wirksworth and Duffield, the EVRA Shop and Pullman Buffet Car. 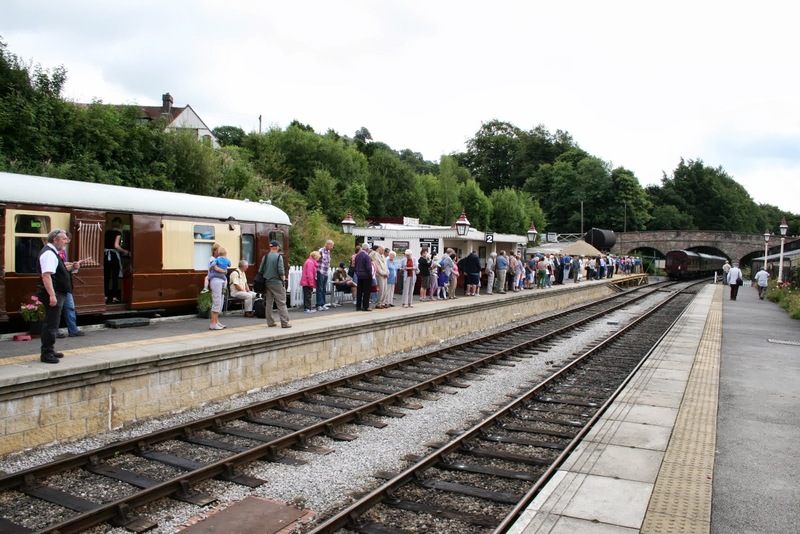 There were extra special contributions by Julie Ball, Chris Beale and Peter Binks who speeded the process by manning the pedestrian gates at Wirksworth and the large gates at Gorsey Bank. We also managed to squeeze in a couple of customers, one hosted by Mick Thomas for trolley testing on the Incline and one hosted by me for their regular calibration of "walking sticks". All good stuff! The dmu maintenance team had a fairly relaxing day as illustrated with Graham and Doug releasing both starter motors from L J Breeze and delivering them to a local contact for repair. Doug also oiled up various freight vehicles required for next week's photo charters. The PWT replaced old and defective fishplate bolts on an area to be re-laid by Birmingham University in mid September with a follow on by boxing up ballast in the area of MP 134. The VCT announced they had formed the 76 Club as all three participants today had reached that young age and declared they had many years of activity before them. They finished their fencing project south of Hazelwood and celebrated by the creation of one significant fire. The death of Charles Underwood yesterday was deeply sad. Charles was a loyal supporter of our enterprise and the next door neighbour of Richard Buckby. He had a background in Railway Civil Engineering and rose to become the last Principle of the School of Transport in Derby. I first came across him as a callow youth, young man, allocated to the British Rail Management Trainee programme and spent a lot of time at the School. ( One of the most memorable lectures was by Brian Clough on the art of management) I was later to welcome him to the bridge of the Manx Viking plying between Heysham and Douglas which I think was a treasured memory. He had a fascination with French narrow gauge and very kindly passed their Association's quarterly magazine to me. A delightful and interesting man who will be missed. Please substitute "Principal" for "Principle"- tut! tut! A steady day after the bank holiday with the p way team split between boxing up ballast south of Shottle and refurbishing fish bolts at Wirksworth ready for the student relay in Sep.
Lone carriage cleaner gave Iris a clean out. JHT with his merry men and Mike Billings on the Komatsu spent the day clearing vegetation along the line in readiness for next weeks photo charters with the L&Y loco. 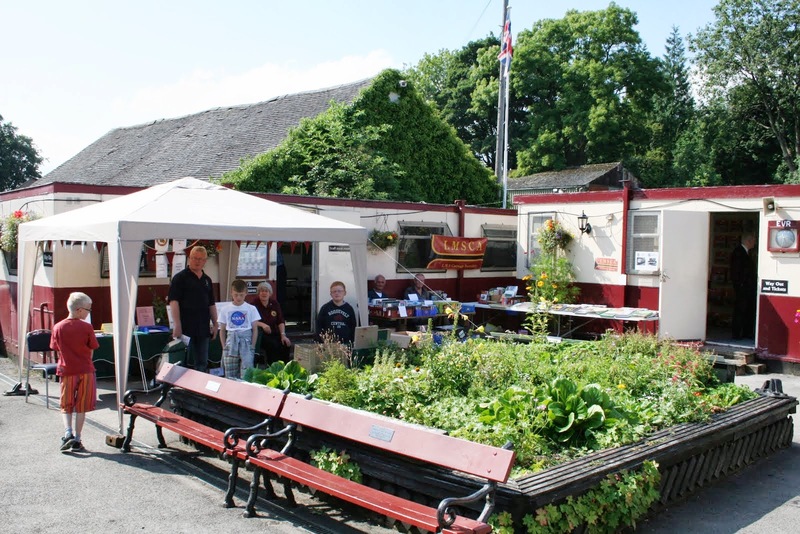 Booking office and buffet were open for business as usual. Many thanks to the 4 stalwarts who gave up their evening to recover Breeze and the train from Shottle last night. There was absolutely NO dirty pots in the mess room when I left tonight. We are currently particularly interested in anybody who is serious about wanting to become a member of the steam locomotive crew for our two Andrew Barclays. New volunteers would have to attend the Induction Session on Saturday 28th September and indicate that this is what they want to do. The work is very tiring, physical and has long hours. Volunteers would be required to start from trainee and work their way to driver gradually unless previous experience can be proved. Do you fit the bill? You only need to be aged 15 and over to be considered for training. E-mail us at ticketoffice@e-v-r.com to register your interest and we'll see you at the Induction Session! Tunes and Chips is approaching! Time is flying by and Tunes and Chips is only a week and a half away! This popular excursion is very nearly full so I would advise anybody who wants to come who missed out on it last year because of booking too late to book online as soon as they can! Not the most exciting of days but the service delivered satisfactory returns with thanks to the train crew, Booking Halls, EVRA Shop and Pullman Buffet Car and my thanks go, as ever, to all who ensured that the money keeps coming in. Tonight sees an attempt to rescue LJB from Shottle. Fred & Iris gave the Mess Hall another good do and it is extremely disappointing that at the end of the day there was another pile of unwashed pots - there is patently no way of shaming those concerned and those folk should anticipate that all crockery will be removed and if a warm beverage is required they should bring their own mug and supplies - absolutely not good enough! Onwards and upwards at the M1M conducted further welding to their SK and the LMSCA pursued the renovation of the Third Open with attention to the frame, ceiling and windows. The DMU team concentrated on reorganising their stores coach and weed treatment by hand had another go at the Incline and around Idridgehay gates. The DST tended to all three locomotives in their care with Henry Ellison being readied for its next outing, No 3 having all its seals attended to and Cathryn receiving further exploratory work. The SBT reported that the top concreting was completed and there had been some exploratory dig to locate the platform drains. PS Today's photo is of a locomotive that was briefly with us but has disappeared - does anyone know if it still exists? 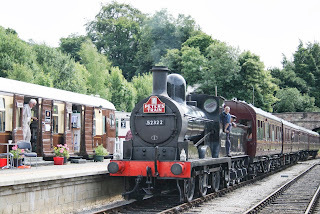 were we running the Duffield and Ravenstor lines, but the Bob Gibbens Special was operating from platform one with experience guests chuffing and whistling their way to Wash Green and back. Down the yard, the DMU team carried on with a variety of curious maintenance tasks, which appeared to be largely associated with finding out how many men it was possible to get into a DMU toilet. Stokes enterprises also addressed the pit with a shovel. Much the same was happening with the PDLG and the class 33, although the preferred confined space in that vehicle appeared to be the generator room and the entire population of South Yorkshire. A most satisfactory day was had in the general area of the till, and this important news was conveyed to the parlour of the Malt Shovel by the Marketing Department's new secure communications system, the Dog-o-Gram. This ensures that the Americans can't read our emails, but tends to take longer as the dog likes to lick people on the way. Today put some heavy demands of our very small team, even I had to leave the Executive Suite and undertake a Guards turn and empty the toilet bins on the loco hauled set, what are we coming to! 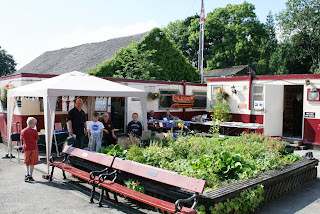 Nonetheless, the service operated well with many happy visitors, the Booking Halls collected a satisfactory amount of cash, the Pullman Buffet Car had its best day of the holiday, the EVRA shop sold their mixed range of products and the narrow gauge entertained. Special thanks to Nathan who looked after Gorsey Bank gates to aid timekeeping. We had stalls, two of which are illustrated, with June selling our extremely successful "Drive a Steam Engine for £10" where the customers were welcomed by Joe and Fred, the LMSCA also selling well to help swell their coffers and Vince on the EVRA stand as part of their membership drive. June and Vince also multitasked to ensure we kept the show on the road. The dmu team assisted with a slight malfunction on Iris, repaired the toilets on 51505, sorted batteries following the sale of the Class 117m and received a weighty stores delivery. My grateful thanks go to everyone who actively participated today - it was a close run thing to deliver what we advertised! A steady start to the day on Derbyshires Friendly Railway despite overcast skies the rain never came so ware soon got down to keeping our passengers happy with the three car starting the day as it set off down to Duffield with the 10.20. 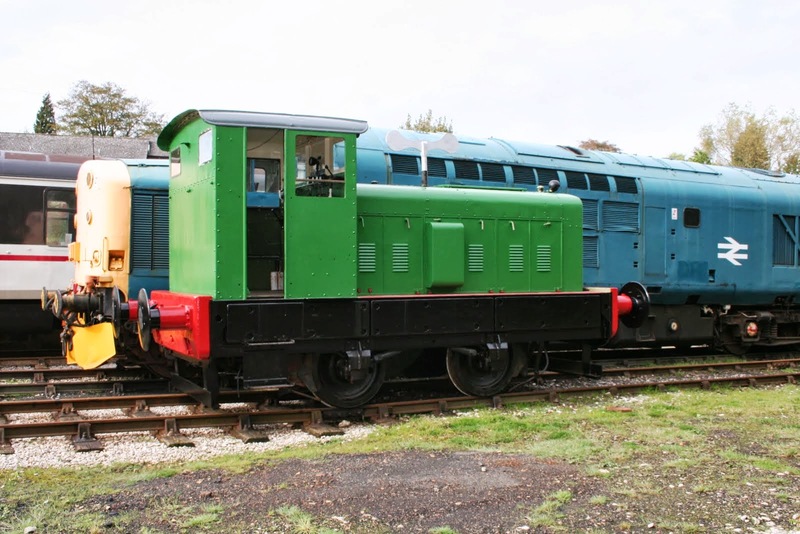 Henry Ellison was the next with drive a loco deal for ten pounds between the station and wash green. Iris ran the Ravenstor service every 30 minutes proving to make one passengers day as he only came to pictures of her . The L & Y ran the 12.20 , 14.20 and 16.20 services which again enthralled our younger passengers , one little boy insisted I was the fat controller and was it Douglas or Donald and what had I done with the name plate as he wanted it . The Pullman buffet and Booking halls had a steady stream of customers not forgetting Pat and June who could be found selling their wares. Oaks enterpises and the 8f group worked on the Duke and No3 ensuring reserection in due course. The Dmu group were to be found tinkering with their units up the yard. The miniature railway did routine repairs to the line and The Narrow gauge was also in operation down the yard. The Lmca was to be found working on the third open in the shed at least they would be dry today. Many thanks to all the staff for providing a special and enjoyable day for our passengers and visitors alike. 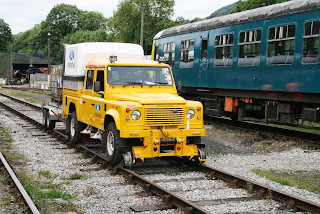 In terms of progress, today we have entertained a number of Diesel Experience Drivers, who have had the pleasure of the Bubble Car and the Class 31 down the line, as well as some shunting, although efforts to rescue LJ Breeze, which recently disgraced itself, were not successful and a larger selection of crowbars will be needed on our next attempt. Meanwhile, back at base, the Station Foremen were at it hammer and tongs in the toilets, as well as outside them, and at the main gate and in the bins, all of which needed attention. For those of you interested in classic traction, the flat tyre on the Station Sack Truck proved to be so classic that even Wasser Tyres couldn't find one like it, though we did give them their afternoon's joviality, and we suspect the way forward to repair the Truck will be to cull two wheelbarrows: this shouldn't prove too impractical as a wide selection of dead wheelbarrows can be found in many locations around the yard at any time, usually when you are looking for one that is operational. Also down the yard the LMSCA's close personal friend carried on with the Third Open, and EVRA's representatives carried on with the other SK. If anyone has seen the Booking Hall's feather duster, this is a crucial missing piece of equipment, and its whereabouts will shortly result in a national search, though not amongst those members of the Booking Hall staff who have never been seen to use it. A delightful day until the very end when the heavens opened. We were well patronised that kept the train crew, Booking Halls, Pullman Buffet Car and EVRA shop active all day with a splendid end of two Victorian Driver Experiences to round it all off. Today's photo is of the luxury accommodation experienced by the passengers of our first train. Thanks go to Julie and Owen who looked after the gates at Wirksworth and Gorsey Bank. Tim Oaks took delivery of some more sleepers to receive the frame of The Duke to allow for that part of the locomotive to be refurbished. The dmu team tended to a throttle fault on Iris and prepared all the combinations required for tomorrow's Drive a Diesel Day, the Bank Holiday requirements and next Tuesday's service. The VCT responded to a request for ivy clearance by a neighbour adjacent to the Station Garage at Wirksworth and then went on to tackle the vegetation either side of the Wash Green bridge. The LMSCA continued with the Third Open and repairs were conducted on the Multicar and Road/Rail Landrover that had no rear lights after an altercation by person or persons unknown. The PWT started the day by coaling up the visiting loco and tripping coal down to the Andrew Barclays following up with some boxing in of the ballast dropped at Shottle earlier in the week. It was good to see Norfolk Dave back on his feet after an operation and he hopes to be back with us in mid October as a founder member of the SMT (Structure Maintenance Team). A curate's egg of a day as the PWT decamped to Shottle to cleanse the platform of surplus material and boxing in the ballast spread on Monday.Unfortunately LJB disgraced itself again and rests silent with the PW train adjacent to the station. The Komatsu returned to Wirksworth ready for further coaling duties and flail testing. The LCC tended to Iris and the Bubble Car and the LMSCA continued their labour of love on the TO. Much housekeeping at Duffield with weed treatment featuring together with a further attempt to collect a sample of water from Duffield Tunnel to try and discover whether the water ingress is the result of a leaking water main above. Deep sadness at Wirksworth as we welcomed a crew looking for a location to film only to be told that we didn't fit the bill. Many thanks to Mike Evans and Nathan for turning in specially for, what turned out to be, a fruitless task. Nonetheless, the Booking Hall received yet more experience bookings and the Pullman Buffet Car benefitted from a warm and pleasant day. Today's photo is from our recent past to recognise the return of our road/rail dumper from Hazelwood for its new role as a overbridge maintenance and inspection vehicle, the driver is our very own The Reverend Patrick Lidgett. My first congratulations go to Anne Boultbee who is taking over from Dorothy the responsibility for Duffield's floral displays that add so much to our presentation on our property and the "main line" platforms. The second area of congratulations go to everyone who participated in today's train services including the crew, the Booking Halls, EVRA Shop, Model Railway display and Pullman Buffet Car. A most satisfactory day in pleasant weather where, amongst all our visitors, I met someone who had fired Garretts between Hasland and Wellingborough and then had a complete career change by working as a gardener at Chatsworth for 40 years and now has been retired for 14 years - do the calculations! The DST have been tending to a modification to the cylinder packing on No3 and the LMSCA continued with the Third Open by painting the sliding lights and repairing the floor. The Class 117 had a roof wash after oil and soot had left quite a challenge and weed treatment by hand spray tried to improve the Incline. The Filing Fairy continued her valued work and a lone track patrol dealt with the Wirksworth to Shottle section. 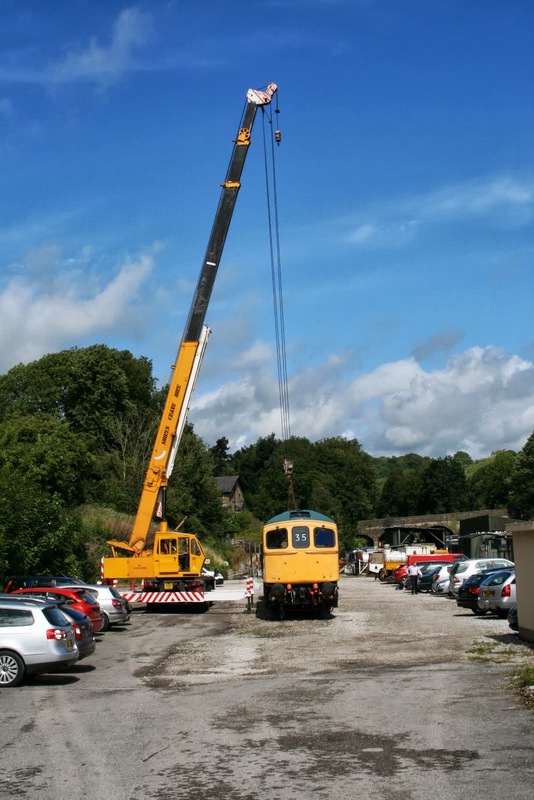 A photo from last week shows a large crane tending to the Class 33 where substantial progress is being made to its return to service. Progress Mon 19th August 2013. Yet another fine day with P Way at Shottle with the works train and Komatsu filling empty bays in the track with ballast from the Rudd. In the afternoon a start was made clearing off Shottle platform with 20 tons of spoil and rocks loaded into the Rudd. VCT were busy cutting trees at Bournebrook Avenue and Idridgehay with several fires. LMSCA had a presence today no doubt doing more work on the LMS 3rd open. A wonderful sunny summer day brought out the crowds after yesterdays Met Office overkill had rather damped them down. His grandness the Chairman came to inspect the magnificence of our endeavour and was pleased to note the till report. We welcomed several groups, including quite a large one from Milton Keynes which occupied John HT for most of the day before we despatched them happily back on their coach. Down the yard, the interminable paint job that is the LMS brake van very nearly reached its final top coat. 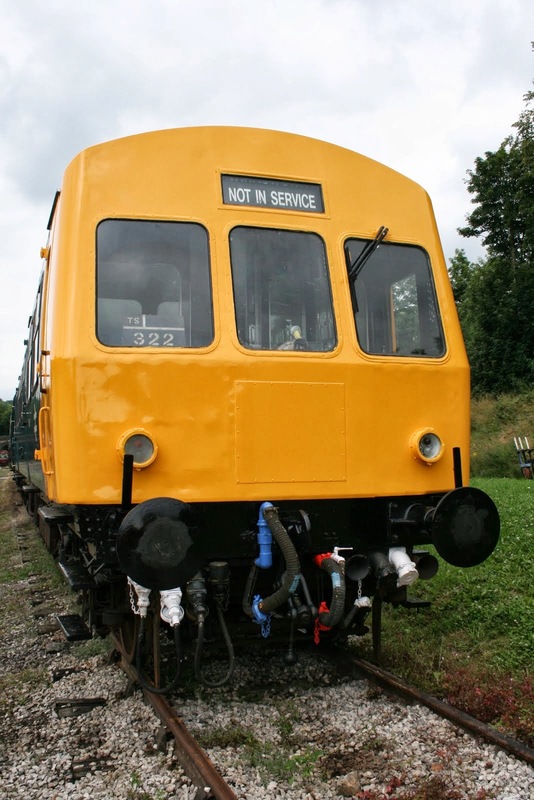 Nearby, the class 33 team attempted to adjust their alignment and this might involve another week of greasing our fitters. The DMU team, who are "resting", attended to the toilet of unit 51505 with a number of pipes being removed and replaced with a rather simpler system in order to improve its reliability, or perhaps flushability. A little snagging in the 119 resulted in the replacement of a starter motor. Some pit maintenance took place and the pit pump has been repaired. Will staff please note that the pit pump should be extracted from the pit using the rope provided and not pulled out using the electrical cable which powers it. The weather decided to take a turn for the worse but failed to deter passengers from visiting Derbyshires Friendly Railway. 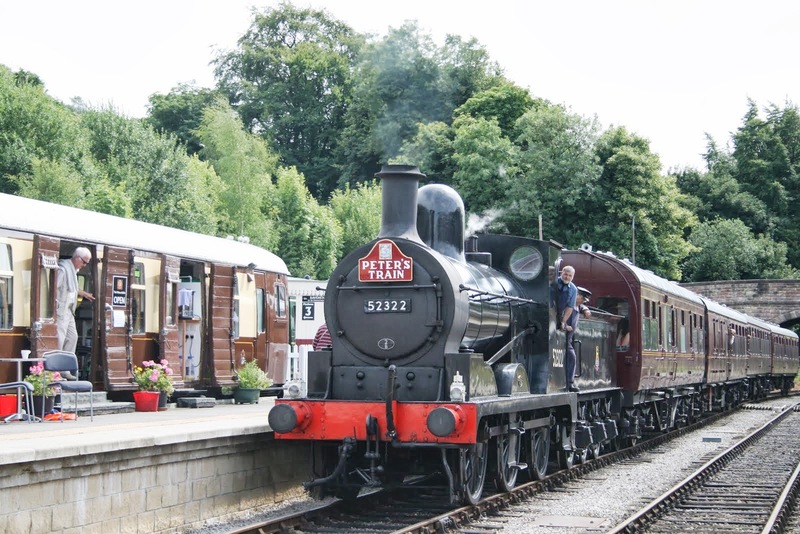 The L & Y helped the Lmca test a steam system before running the 12.20 14.20.16.20 services then went engine and brake to Duffield at 1820 with the two driver experiences. The 8f group were busy assisting Oaks enterprise team on the Dukes Chassis. The miniature railway was busy with interest by young and old as the 060 steam tank engine was put through its paces . > Many thanks to all the staff for their stirling efforts esp Stuart who kept us on time by keeping Gorsey bank gates open for the steam service. investigate the nooks and crannies of the station. In the yard, the class 33 team put their equipment under the microscope, having returned the generator on Thursday and there being only a "thousands worth" of adjustment to do with a large spanner and a number of parts, and politely refused the offer of the Passenger Department's gaffer tape. In the meantime they also charged up the batteries. In the shed, the LMSCA carried on with their open topped Third Open and evidence of progress was very clear in all parts of the carriage. Around the station, the usual selection of Friday repairs took place, and the Ladies once again benefited from Nathan's attention. At Shottle more inspecting, shovelling and screwing attended the ramp. The main event today was to welcome Peter Taylor's friends and relatives to celebrate his life and tremendous contribution to our Railway. Reserved accommodation was provided on the newly restored Class 119 and an excellent lunch was served in the Pullman First Open. 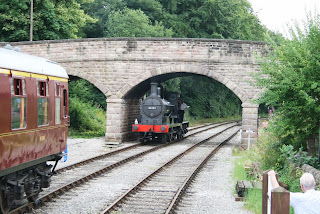 The party then returned on the 1420 Wirksworth to Duffield in the Royal Saloon and first class section of the CK. The headboard created by Alan Taylor was conveyed on all trains today and much admired by Peter's participants. My thanks go to today's train crew, the Royal Saloon steward, Booking Halls, EVRA Shop and Pullman Buffet Car who entertained our guests extremely well and carried substantial numbers of visitors to the benefit of all our tills. Mike Evans and Tom Tait are to be congratulated for removing most of the sulphurous deposits that had left the Pullman set in an unacceptable state. They are also illustrated! A possible first was a small jazz band playing on Platform 2 as Peter's guests arrived and continuing through the lunch time period to the delight of all our visitors. An electric banjo must be a first for our enterprise. The VCT concentrated on an area around Footpath F5 which lies north of Hazelwood and declared themselves satisfied with a two fire day. They also creosoted the restored PW hut south of Hazelwood bridge. The lone Watt provided a PW presence as he assessed the preparation work needed to receive a further contingent from Birmingham University in September. The dmu team generally assisted throughout the day and made further attempts to cure a water leak on Iris's engines. A very large crane spent the day tending to the Class 33 as the newly restored generator is returned to the locomotive. Quite a task to get the alignment right. An omission from yesterday's report was a further contribution by the Head of Gardening to the Wirksworth displays. It was good to welcome back one of our regular test customers as they were put through their paces by the Vehicle Acceptance Body. A photo is attached as they neared the end of a gruelling day ably hosted by Mick and Doug. The PWT travelled south to accomplish a range of tasks including moving some stonework from Hazelwood to Shottle for the platform project, gathering a wagon load of seasoned logs, returning the road/rail dumper to Wirksworth and shunting empty Lowes to Shottle Sidings to await their next task. The Filing Fairy kept up the pace with her quest to get all our records squeaky clean and Rodney tended to a number of housekeeping tasks at Duffield. The SBT reported that all courses of the platform renovation are now complete together with the return at the north end. They joyfully revealed the most of the heavy lifting was also now complete. The LCC cleansed the loco hauled stock and the Pullman Buffet Car benefitted from today's test customers hunger. The Booking Hall received yet more driver experience bookings which is proving to be an inexhaustible supply of revenue this year. However, Robin and Leigh have now completed the testing of our experience days so that they can be sold On Line having wrestled with a most complex computer algorithm that will allow for definition of whether the experience is a direct sale or intended as a gift and recognise the combinations of booking permitted. It will also introduce "demand pricing" much beloved by Ryanair which reflects tremendous credit on their combined skills. The objective is to make these products as automated as possible to reduce the admin time necessary to process each reservation. We are extremely fortunate to have these skills available to us. The team that delivered today's scheduled services together with the Booking Halls, Pullman Buffet Car and EVRA Shop again deserve our thanks for a moderately satisfactory day against indifferent weather. Many happy faces were testimony to the welcome our visitors had from all involved. The DMU crew basked in the success of the Multiple Memories Weekend and deserve a real round of applause for an event that worked so successfully after all the planning and hard work that went into it. The steady stream of praise and congratulations is extremely well deserved. The DST entertained the boiler inspector that signed off Henry Ellison for another year of service and made some helpful observations regarding the restoration of Cathryn. The M1M continued with their high speed restoration of the SK which will provide more seating capacity for our loco hauled set of coaches. The LMSCA concentrated of the TO with more windows being bedded in, the excess sealant cleaned off, ceiling painting and further structural timber work. The quest to strengthen and weld up the flail head for the Komatsu reached a satisfactory conclusion with tests planned for next week. Another film enquiry received attention with results as yet unknown. Quite a satisfactory and productive day. Progress Mon 12th August 2013. Another earning day with a group taking over the coaching stock for the the day with a photo shoot adding money to our bank account. P Way loaded all the spare rails, fittings and timbers laid around Wirksworth site left over from various jobs ready for tripping to Shottle. 4 bags of loco ash were used to fill some of the empty bays in the track at the North end of the yard reducing the risk of trips and falls when walking around trackside. VCT had 2 fires at Idridgehay and carried out pointing repairs to the downside parapet wall on bridge 12 after damage from a falling tree during high winds last winter. Weed killing team were out with the special weed killer for mares tail and managed to treat the whole line. Buffet enjoyed much patronage from the photo shoot visitors and a few passing customers. Rodney was again at Duffield attempting a repair to the ladies toilet water heater amongst other things. The first day of our first DMU event since the opening of the Duffield line. 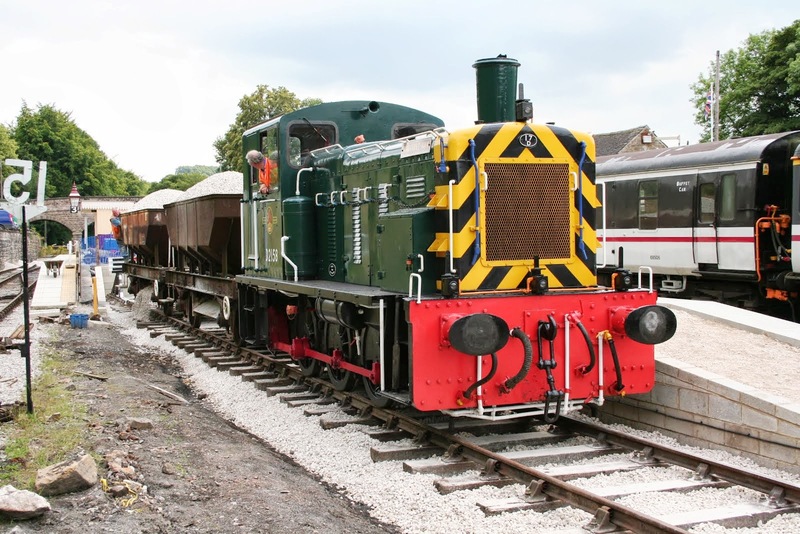 It featured the launch into traffic at 12:20 of Class 119 W51073 after 5 years of restoration from a shell. Many different combinations were ran during the day, culminating in a busy fish and chip special with all nine cars. Around 150 passengers were there to see the spectacle and it was thoroughly enjoyed by all. Not only could the guards buzzer be heard regularly during the day, but so could the bell on the till. A quiet and pleasant day of pottering around with a number of experience guests in the railcars. Much routine preparatory work for the upcoming weekend and the usual selection of general repairs and renewals including a unique water diversion device in the Gents to stop people fecklessly running hot water all over the floor. A most invigourating day with tills ringing throughout the enterprise. My thanks go, as ever, to the train crew, John who looked after the Gorsey Bank gates and run rounds, EVRA Shop, Booking Halls and Pullman Buffet Car. Tremendous effort by everyone involved. The dmu team fitted some fancy exhaust guards to the exhausts of the Class 119 and assembled, fuelled, and prepared the various combinations for the Multiple Memories Weekend. It all promises to be an extravaganza for anyone with an interest in these venerable vehicles. The M1M were stripping the cladding from 4 compartments of the Sk and lifting the flooring of a vestible as they continue with the restoration of this vehicle. The LMSCA continued with their renovation of the TO. The PWT decamped to Shottle to continued fettling the loop there and the VCT had a two fire day just south of Hazelwood near Milepost 134 3/4 declaring that section complete allowing for fencing repairs next week. Today's photo is of 52322 moving towards the 1620 departure from Wirkswoth. 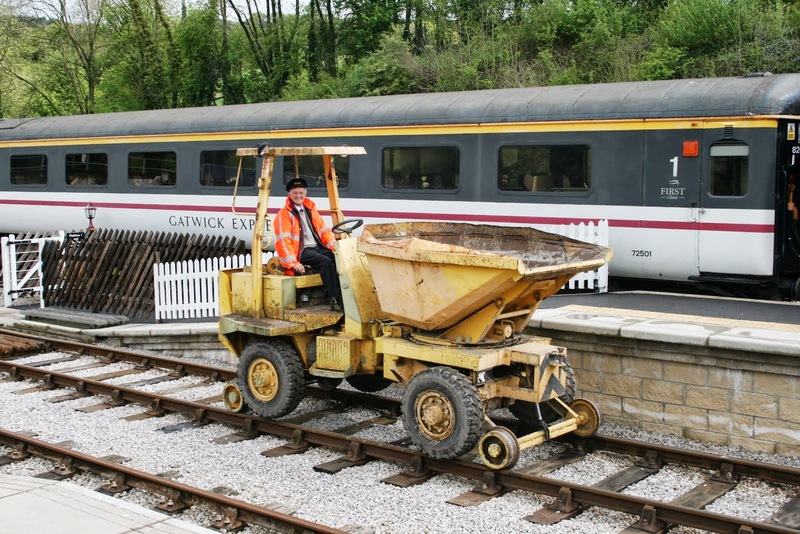 An omission from yesterdays report was the construction of the steps at the end of the Wirksworth platform extension that completes this job for the time being. A photo illustrates this new component. In the background the Class 119 receives yet more attention to its presentation as it becomes the most coveted possession of the dmu team and will delight passengers that are admitted to its glory. The PWT set sail for the south and, amongst other activities gathered three wagon loads of logs for sale at Wirksworth. A warming fire was put into 52322 for its work tomorrow and the LCC gave the loco hauled set a clean ready for our visitors. The Filing Fairy also made yet more progress in the records for our enterprise and the SBT completed their second course of stone as this lengthy project nears the work needed to deal with the drainage of the building. Fuel featured as more coal was delivered alongside more diesel to ensure the Multiple Memories can be delivered. A boiler inspector tended to Henry Ellison that passed the internal part of the process. Yet another filming enquiry was dealt with and our regular Walking Stick customer returned for a short period. The Booking Hall and Pullman Buffet Car had an encouraging day as the weather was quite pleasant again. Another most satisfactory earning day with great thanks to the train crews, Booking Halls, EVRA shop and Pullman Buffet Car who all entertained, with their usual skills, today's visitors. Fred & Iris were given their customary welcome as they cleansed the Mess Hall of sundry pots left unwashed but sadly, as I left tonight, a replacement selection was left to be dealt with tomorrow! A coach scythed into the Wirksworth Yard at 0930 bearing some 29 representatives of the BBC as they had a technical reconnaissance for a future filming job with us. The dmu team spent the day pimping their vehicles for the Multiple Memories Weekend and today's photo illustrates the standard of presentation that the attendees to the event will witness. The M1M were in action with their SK and the LMSCA tended to the exterior bodywork of their TO. The DST were removing boiler rivets from Cathryn, washing out and stripping down Henry Ellison for a visit by the boiler inspector and removing piston rods from No3 to provide a pattern for a new tool required for renewal of the piston packing. Mike Billings made inroads to repairs to the Komatsu flail and Richard P gave Wirksworth Yard another dose of weed treatment. 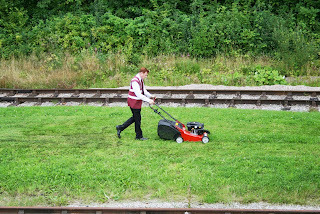 Track Patrols were out on their fortnightly check of our "Main Line" and Mick Kingsley mowed the grass at the entrance to Wirksworth Station whilst Rodney continued to do battle with the growth south of Duffield Tunnel. The SBT reached a milestone in their endeavours with the conclusion of the bottom course renewal and has only 8ft to go with the second course. Some 12ft of backfill was also achieved and Nathan cracked off a number of domestic repairs at Wirksworth. Quite a busy and productive day. Progress Mon Aug 5th 2013. A better day than forcast had P Way out with the works train packing track joints around the Barnsley Lane area with only partial success owing to bad rail ends. What tends to happen after years of heavy traffic (stone trains) the rail ends become bent down at the joints with worn fishing surfaces and battered ends. The only cure is replacement or cutting back approx 30 inches off the rail ends which means about 4 extra rails are required every 1/4 mile and a big job to boot. It is possible to buy a machine to bend the rail ends back straight but can be fraught with problems in cold weather hence the nickname of one particular machine I remember from many years ago called the snapper. Also using this machine doesn't cure the other defects on the rail ends- a problem we have yet to find a solution for. Rained off in the afternoon meant a trip back to Wirksworth to load baseplates and pandrol clips for Wednesdays activities. DMU team were out in force today preparing stock for this weekends DMU extravaganza with apparently the longest train yet to run on Wyvern metals. A feast for DMU fans so don't miss it. VCT busied themselves with just 3 members cutting trees and 2 fires South of Shottle. Buffet was open but was hardly hectic given the weather conditions. Steam team turned up late in the afternoon for some extra curricular activities weighing the wheel loads on No 3. As the sun shined on Derbyshires friendly railway we settled down with the 3 car Dmu leading the way with the first service to Duffield aftter which it was placed in platform one in between the steam services to recieve a good wash n wax ready for the Dmu gala next week. The L &Y entertained the steady numbers of passengers as did the pullman buffet. Down the yard the 8f group did further work on Kathryn. Oaks enterprises got the duke ready for the frame lifting the 33 recieved further work ready for the return of its generator. The Dmu team carried out cosmetic work on the newly restored class 119 railcar. Another pleasent day many thanks to all the crew and passenger staff for their sterling effort today . A rather pleasant summer day, sunny but not too hot, in which we pottered up and down with the day's steam driver experience guests. In the afternoon the saloon uniquely hosted a wake, to the surprise of a number of ordinary visitors. 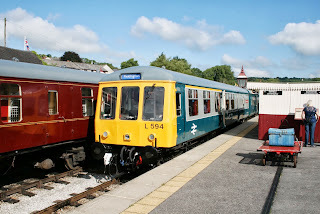 Meanwhile, the Private Hire end of the DMU team painted the west side window seals of the class 119, one of the superior touching up activities designed to make it look the part. In the shed the LMSCA and their close personal friend carried on with the structural work to the Third Open and debated the relative ageing of braised steak based casseroles under various conditions. Around the station, the Foremen attended to the doorstep of the Extra Ladies and this is now more stable than the charming Portacabin that it leads into. In the afternoon further work took place to grade the access ramp being constructed at Shottle, though the application of a piece of string very nearly resulted in the ordering of several hundred tons of additional aggregate filling, however, Cooke Enterprises devised a cunning plan in which a diversion will reduce the work involved. Well we did bask in the warmth of a splendid day as the customers poured in and coffers were most pleasantly filled. My thanks go, as ever, to today's train crew with their supplementary gate opening activity to speed the "main line" service and a great welcome to the Foxfiled Railway driver and fireman. The Booking Halls, EVRA Shop and Pullman Buffet Car all did great trade to very good effect. Down south the VCT concentrated on an area south of Hazelwood involving two fire and tended to the restoration of the Permanent Way hut just south of the station site. Alan returned to Wirksworth to fix two well restored enamel signs to the fence on Platform 2. The M1M multitasks with an operation of the narrow guage and tend to the corridor flooring of the EVRA SK. A new audible warning device has been fitted to the narrow guage ensemble involving technical matters that passed over my head but at least they can be heard clearly. The dmu team assisted with the various service train movements and fitted lighting into their tool container. The exhaust grills of the Class 119 were painted and air leaks tended to. The windscreen wipers on 50170 were restored to health. A most pleasant and productive day. 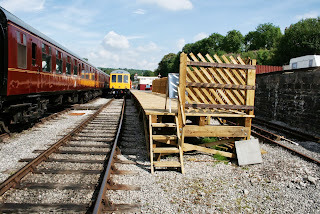 PS As no time presented itself for a current photo I attach another reminder of the recent past showing the ballasting of the then new siding to accommodate the catering set. The O3s are of fond memory!